My memory may have been ‘photo shopped’ by nostalgia but it wasn’t just their looks that appeared ‘unfinished’. Big Brother Africa Season 7 aka Big Brother Star Games opened on Sunday May 6 in Johannesburg, South Africa with much pizzazz. And those who love rap especially the brand promoted by Jay Z’s Roc Nation would have had fun as one of its artists Grammy-nominated J. Cole performed at the season debut event. For months, many had been looking forward to the new season of Big Brother Africa, not unlike the return of a long lost love. So far, it’s safe to say that the show is unravelling just the way its many faithfuls would have hoped. Each passing day brings a new twist. Anything can happen in the Big Brother House after all. As today is Day Seven, you are in a better position to know how the housemates are shaping up. For me, it’s only Day Two of the Big Brother Star Game as I write this. The House is divided into Upville and Downville with about twenty-eight housemates from fourteen countries with new entrants Sierra Leone and Liberia making their first appearance. There are also seven VIP housemates (in Upville) who are celebrities from different countries. Award-winning musician Goldie is representing Nigeria. Things look very promising and this can mean different things to different people. There may be a few salivating at the prospects. Yet some query how anyone can stay glued to TV watching people who’re basically not doing much or going anywhere. At least, I can claim to have a professional interest but the fact is that you can approach reality TV as you would a drama series. All you have to do is key into the different stories and it doesn’t matter whether they’re contrived. In just two days, there are already people like Seydou (Angola) to watch out for. Some of the girls look like drama queens. How are all these people going to cope with being cooped inside one small space for up to 91 days? 29 year old interior decorator Ola Bakare and 25 year old fashion designer Chris are the Nigerian housemates in Downville. While Ola is tall and a little bulky in the middle, Chris is much shorter. Incidentally Chris’ height (or the lack of it) is only noticeable because Ola stands at an impressive 6ft 9”. When Ola is not close-by, or when standing with the girls, Chris cannot be described as short. But the two are ‘friends and not friends’ as they describe themselves. Nigeria has won the last three editions of Big Brother; do these friends stand a chance of winning the $300, 000 prize? 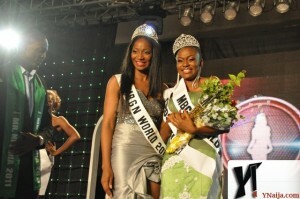 The Most Beautiful Girl in Nigeria pageant is all of twenty-five years old and this is not football or modelling age. So, congratulations are in order to the Silverbird Group; for sticking with entertainment. There are quite a few women who owe their progress in life to MGBN. Although I have some reservations about certain aspects of beauty pageants, but think of the Nike Osinowos (Soleye), Bianca Onohs (Ojukwu), Omowunmi Akinifesis, Adaeze Igwes (Yobo), Munachis, etc. You’ll have to agree that choosing that path appears to have paid off. But, I digress. The reason I’m writing this is because MGBN is in the news again. There’s the celebration of a quarter of a century’s existence. And there’s the 2012 edition of the pageant which held two Saturdays ago (May 5) in Benin City and was broadcasted live on STV and AIT. I got wind of the event on Twitter. I rushed to TV to watch because I thought it was going to be a light hearted way to pass the time. But I couldn’t stay on long enough to know the winner. It’s possible I joined at a bad time because I saw only Chuddy K’s ‘performance’ (I think) and the poor camera work- managed to strip off some of the excitement. Quite a lot was wrong on the night. First, let’s look at the hosting, that fell short. Hosts Chris Okenwa and Toke Makinwa didn’t have the chemistry. Not even the minimum you’d expect from people who work for the same organisation. From my assessment, Chris was chiefly responsible. Apparently not working to any script, he was fiercely competitive, acting as a wall instead of a flexible companion. In his responses to Toke’s comments (or the lack thereof), he may well have been a wall that bounces things off back to sender. Toke on the other hand tended to try too hard and may have been a little too feisty, perhaps, because Mr Okenwa strived to carry on like he’d have preferred to be a lone presenter. And what was with the sexist jokes? Why did we have to hear about the hot girls like someone hawking raw meat? The rather stark stage decor didn’t help matters. Edo State may have been in mourning understandably as a result of the murder of the governor’s close aide. But, still. Then, the girls, the reason for the event. Well, let’s just say they didn’t appear to be up to the past MBGN standards. It’s possible that I’m suffering from selective remembrance. My memory may have been ‘photo shopped’ by nostalgia but it wasn’t just their looks that appeared ‘unfinished’. There was the grooming too. Although none of this makes any sense when put against the perspective of MGBN being 25 years old. Has someone dropped the ball? Shouldn’t the pageant be improving? I’m judging this purely from the confines of my couch of course. Who knows those men who were trying to affect boredom but methodically filming the girls must have had some fun? When are we going to get a proper documentary on the MGBN story? That hurried ‘announcercial’ no be am’ at all. Who wants ‘Frank’s Help’ to be a millionaire? Do not attempt to turn this into a usable acronym say WWFHTBAM like its original the franchise WWTBAM (Who Wants To Be A Millionaire). Something is happening at and to WWFHTBAM (sounds like a curse word) that I don’t understand. I haven’t been paying that much attention to this show hosted by Frank Edoho. Having watched the UK version and seeing how much Frank Edoho had understudied the UK host Chris Tarrant, I wasn’t in a rush to jump back in. Plus, because of the studio fire incident, old episodes were being rerun (I don’t like reruns except of matches in which my football club won). So it’s possible that what I now consider strange has been happening for some time. And for all I know, these are not fresh episodes. Nonetheless, something strange and unpalatable is going on. Long story short, the host of WWTBAM Frank Edoho appears to be under ‘advisement’ to help push certain contestants along. Either that or it’s that he fancies the acronym WWFHTBAM and thinks it a better alternative. The short of this is that I’ve noticed that on at least two different occasions, Mr Edoho bent over backwards to help a contestant along. When contestants offer the wrong answers, he has a way of saying it out loud again with just enough incredulity to send signals to the player. On Friday 27 (AIT) a male contestant who didn’t know that Eiffel Tower was the landmark in Paris, used up two life lines one of which included calling his friend, a ‘professor’. The next week (May 4 around 8 pm), there was yet another person Frank hinted (helped) to win a manageable sum. That one didn’t know that a good looking woman can be described as ‘comely’. His first option was ‘homely’. And Frank said it loud: “A good looking woman is h-o-m-e-l-y?” Even a dunce would have a rethink. In the end, in spite of Frank’s suggestion that the man could walk away, he still opted for something crazy like ‘cupid’. What’s the point? Na by force? I don’t think anyone who doesn’t know some basic stuff should win even N5. Winning or the appearance of people winning may do some good PR for WWTBAM but what about the viewer who hopes to learn a thing or two? Even more important, what about making TV interesting for viewers? No the governor's aide died BEFORE the contest. The governor's aide died after the MBGN contest! Please get your facts right! Nike Osinowo and Bianca Onoh were NOT MGBN. They were Miss Nigeria. #wwtbam… I don't even get ur point… Is it ur money? #wwtbam. sweetheart ur point is???? is it ur money? it shows u haven't been watching d show. frank has been that way for a while? started when we didn't quite have enuff winners… big winners!!! and frank helps many contestants. as for 'learning' at the end d right answer is shown sooooo???? ?